This is the birth of my 2nd VBAC FIRST Hypnobabies baby! 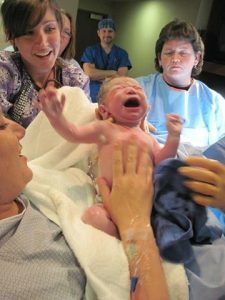 It was magical because I was in my birthing time all day and didn’t realize I was as close to Birthing as I was. We just moved a few days prior and had several items to attend to that were an absolute must so I went about the day experiencing pressure waves every 10 minutes.. At the end of the day we took our older two to the park to play and I remember swinging through the waves which felt great! Once we got home I told my husband I was pretty sure we were in our Birthing time so we put the kids to bed and he made us a snack of fruits, veggies, cheese, and crackers. We sat to watch a movie thinking baby wouldn’t be born until much later the next day, probably because I looked “too good” to be close to birth. Once he went to bed I got into the tub and listened to my Birthing Day tracks. After a while I couldn’t get comfortable no matter what and at this point waves were coming every 5 to 7 minutes. 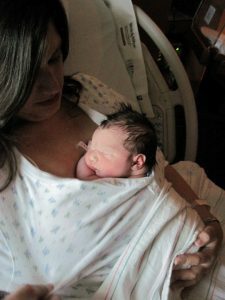 I could feel a bulging bag (amniotic sac) as well and decided to go ahead and go in since we didn’t plan a homebirth. It took a while to wake my husband so I managed to wake the kids and gather everyone’s belongings we had prepacked. I wasn’t too excited about the 15 minute car ride but thankfully my Hypnosis tracks got me through it. Once we arrived to the hospital I immediately walked myself up to L&D while my husband waited for my parents to arrive. I was lucky enough that the hospital put my Hypnobabies Birth preferences and Door sign in my file when we pre-registered so they knew I was a Hypnobabies mom and took me straight to my room. Once in there I continued to do my thing and listen to my hypnosis tracks while the nurse and doctor did their thing. After a few intense waves on the ball I exclaimed that I was feeling lots of pressure so they got me onto the bed. At this point I wasn’t in a place where I could say “no” so I did but asked to NOT be laid down, luckily they knew I was serious and helped make me comfortable. After 2 1/2 pushes this guy came out! He weighed 8 lbs. 4 oz. and was born on his guess date around 4 a.m. He was so calm and happy after he was placed on my chest and stayed awake and alert for hours! It was a little over an hour from arriving at the hospital to having baby. One of the funniest things was I remember hearing my birthing tracks still playing in my ear while he was being weighed and the placenta was being delivered. Such a great birth! I didn’t even realize the Hypnosis worked until after he was born!